The P5M was the last in a long line of US Navy patrol flying boats. Developed from the smaller PBM Mariner, the P5M was generally larger in all dimensions. Weapons loads were carried in bomb bays built into each of the engine nacelles. It was designed with various turrets for defense and originally had a lower horizontal stabilizer. When it was realized that the guns wouldn't be much help, they were removed and the aircraft reconfigured for the ASW mission. A large search radar was installed in the nose and a MAD boom in the newly redesigned T-tail. If not carrying depth bombs or torpedoes in the weapons bay, additional fuel tanks could be carried. The aircraft also had a wide range of sonobouys in the hull which could be quickly launched to assist in sub hunting operations. However, the writing was on the wall and the P5M was overtaken by the P-2 and P-3 ASW planes and the E-2 Hawkeye for early warning. The final big boat operations were carried out in Vietnam during the mid/late 1960s. The only other nation to use the P5M was France, who received their Marlins in 1959 and operated by 27F. The P5M was reclassified P-5 in 1962 when US aircraft type designations were all changed to match USAF numbering systems. There are those who like their kits big and this one will certainly help to fill the bill in that regard! A new kit this isn't so you won't find engraved panel lines or super detailed cockpits. The plastic is a touch on the thick side and detail is, for the most part, raised with fine rivet representations. If you can't live with raised panel lines, then you won't be building a P5M. I found quite a few sink areas on thicker parts, such as bulkheads and seats. There was no flash as this is a pretty early release. Ejector pin marks are well contained to the inside of some smaller bits. The kit includes two pilots, both of whom seem to have been standing in front of a cannon when it went off as they have large sunken chests! There are separate landing flaps and cowl flaps. Beaching gear is also provided. As you can imagine, the cockpit is basically a floor, seats and pilots. If a detail set is around for this kit, I'd recommend picking it up. The weapons bay is molded shut so there are no stores. Instructions for this Minicraft version are well done with the usual construction blocks. A written sequence is also provided. Color info is provided where needed in the applicable sequence. De cals are provided for three options. One is French with 27F in dark blue with light gull grey undersides. This is the only marking scheme shown in the instructions. 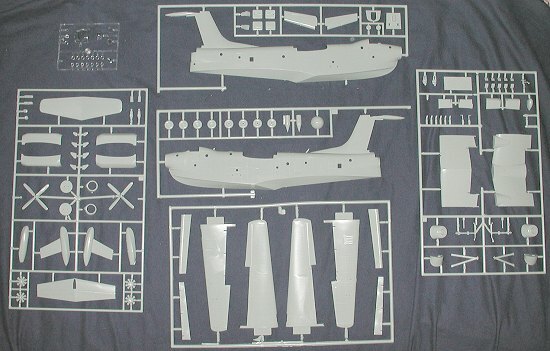 The VP-40 scheme is white over light gull grey and photos of a completed aircraft are shown on the front and back of the instruction sheet. Actually, you get two serial numbers for VP-40, but only one nose number. The VP-45 option is in what appears to be engine grey with at white fuselage. The only assistance for this scheme is the box art. It is quite possible that there was another sheet in the kit that provided the US schemes, but it isn't in my kit. The decals are rather thick, but well printed. 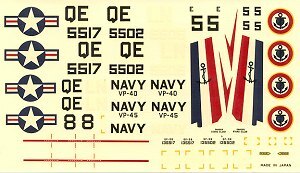 The French blue is a VERY dark blue, however, there is no other option when it comes to P-5 decals! Despite their age they have not yellowed and are probably still quite usable. This kit has been around for decades and I've yet to see one built up. If your tastes are toward big flying boats, then you really should consider this kit, despite the age of the molding. If you would like your product reviewed fairly and fairly quickly by a site that has over 200,000 visitors a month, please contact me or see other details in the Note to Contributors.